New Hanover County’s Environmental Management Department has implemented innovative programs that help reduce the county’s reliance on landfill disposal. These programs have created a comprehensive, effective solid waste management system that will help extend the life of the landfill and protect our environment. Learn more in each section below and by viewing this fact sheet about the county’s most recent projects. 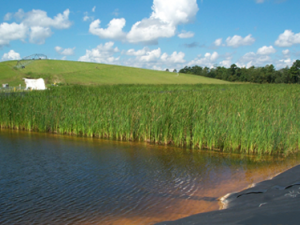 In 1990 staff began to research the use of constructed wetlands to treat landfill leachate as a viable option versus conventional treatment. 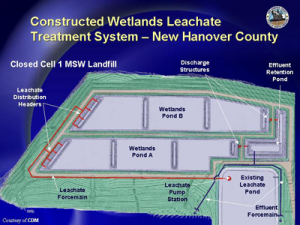 At this time the use of constructed wetlands as treatment systems was relatively new and there were no existing projects that used them to treat landfill leachate specifically. In 1992 staff chose to further pursue wetland treatment options based on preliminary findings and began moving forward with the design of a pilot system. The primary purpose of the pilot constructed wetlands project was to determine the feasibility and treatment efficiency achieved by using manmade wetlands to treat landfill leachate. In July 1993, New Hanover County’s Department of Environmental Management was awarded a Coastal Area Management Act (CAMA) grant from the North Carolina Division of Coastal Management. The grant was awarded to fund the development of an educational program to be used in conjunction with the constructed wetlands pilot project. The educational program targets junior high school students and teaches them the importance of and the effects of specific pollutants on water quality. Parameters tested for include ammonia nitrogen, pH, dissolved oxygen, nitrates/nitrites, and total nitrogen. In October of 1994 a second grant was awarded by the Water Environment Research Foundation to North Carolina State University to conduct research on the project. The North Carolina Sea Grant program was also involved in the construction of the system and research conducted at the site. The pilot project consists of two surface flow wetland cells and three subsurface flow wetland cells. In the surface flow cells there is approximately twelve inches of surface water in which leachate is allowed to flow through freely prior to exiting the system. In the subsurface flow cells leachate is forced to flow through rounded river rock below the surface before exiting the system. Wetland plants were established in the Spring of 1995 and leachate was gradually introduced beginning in September of the same year. The wetland system was then monitored over the following four year period. The system proved to be a viable treatment option. Results of the research indicated that the constructed wetlands could be used for either primary or tertiary treatment. Other benefits from using constructed wetlands versus conventional treatment include providing wildlife habitat, creating an aesthetically pleasing treatment system, create educational opportunities, research opportunities, lower operation and maintenance costs, and lower capital costs. Students and interns from both the University of North Carolina in Wilmington and North Carolina State University have participated in various stages of the project or have used the wetlands to conduct research for Masters and Ph.D. degree thesis. The research results obtained led New Hanover County to pursue construction of a full scale system. In 2002 New Hanover County was awarded grant funding in the amount of $785,000 from the Clean Water Management Trust Fund. This money was used in conjunction with $243,500 of matching funds from New Hanover County to design and construct the system. 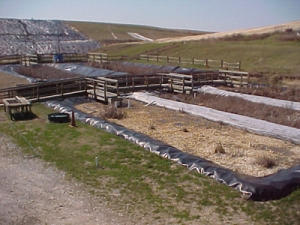 The full scale constructed wetland treatment system is capable of treating nearly half of all the leachate generated at the landfill. The landfill now operates this 5.66 acre wetlands treatment and irrigation system designed to treat up to 60,000 gallons/day. The treated leachate from the wetlands is irrigated onto closed landfill space as low grade liquid fertilizer. Currently the system treats approximately 7,000,000 gallons of leachate each year. This total represents approximately 40% of the total leachate generated. The remainder is treated in a conventional biological wastewater treatment plant. As additional landfill space is closed in the future, the irrigation system will be extended in order to irrigate more treated leachate. The constructed wetlands helps to “close the loop” by re-directing and reusing our treated leachate in an effort to protect the water quality of surface waters in southeast North Carolina from pollutants leaving our facility. This system serves as a model for other industries and municipalities as an alternative to conventional treatment practices. The wetland treatment system is cost effective, aesthetically pleasing and provides wildlife habitat. The irrigation of treated leachate also cuts costs by helping to maintain and increase the vegetative cover of our closed landfill space as well as to protect the landfill side slopes from storm water erosion. Both constructed wetland projects have gained international attention. Representatives from the government of Thailand and India have visited and shown interest in the project as potential low cost alternatives versus conventional treatment as their countries continue to develop. For additional information or to arrange facility tours, call (910) 798-4400. 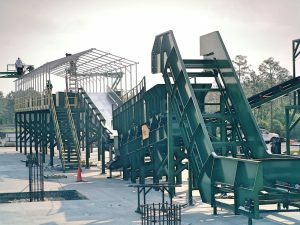 The New Hanover County Landfill diverts inbound loads of waste that are from new construction, remodeling, or demolition projects to a recycling pad. Over 6,000 tons per year are kept out the landfill by separating and recycling wood waste (such as scrap lumber and pallets), cardboard, asphalt shingles, scrap metal, carpet, old appliances, bricks, concrete, and gypsum wallboard (sheetrock). The system pictured above, which came on line in June 2016, will increase recycling rates from 6,000 tons/year to 60,000 tons/year! Asphalt shingles are ground and mixed with hot asphalt for road paving projects. Cardboard is recycled into new boxes and packaging material. Scrap metals, such as copper, steel, and aluminum are reprocessed into new products. Brick and concrete are crushed and used as a structural road base material. Wood waste is ground as used as a boiler fuel, in compost, or as mulch. Carpet and carpet pads are recycled back into new carpet and carpet pads. Gypsum wallboard is ground and added to compost or used as a soil amendment. The public can bring unpackaged food waste to New Hanover County’s composter free of charge. The composting program diverts food waste from the landfill, and makes a meaningful step towards reducing the amount of waste the county generates. Learn more about where to bring food waste, and what is accepted on the composting webpage. New Hanover County residents can now safely dispose of unwanted household chemicals and electronics six days a week for free. It is the only facility of its type in southeastern NC and offers convenience and an environmentally responsible way to dispose of dangerous materials. 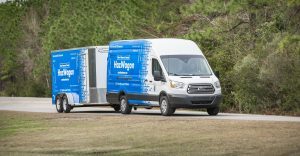 In addition to the permanent facility, the county’s new HazWagon, a mobile collection unit, is stationed each week in Ogden, Wrightsville Beach, and Carolina Beach. The New Hanover County landfill is located on over 700 acres in the northwest part of the county identified as Xeric Sandhill Scrub habitat (Coastal Plain Variant). Nearly half of the site – over 300 acres – are protected natural wetlands (Tidal Cypress-Gum Swamp habitat) and make up the eastern border of the site adjacent to the Northeast Cape Fear River. Evidence of abundant wildlife throughout the property attest to the environmental conservation and restoration efforts of the Environmental Management team. The site hosts numerous critters like raccoons, black bear, deer, turtles, alligator, and waterfowl such as the blue heron and bald eagle. Recent natural surveys indicate the presence of two interesting species: Aristida condensata (Big Three-awn grass) and Masticophis flagellum (Coachwhip snake). These species are listed as State “Threatened” and “Significantly Rare”, respectively. As the site continues to develop, increasing emphasis is being placed on protecting, conserving, and restoring any loss of habitat. Working in partnership with UNCW, the NC Plant Conservation Program, and the NC Natural Heritage Program is key to our success in working in harmony with nature. If you’re interested in a site tour, please contact the Environmental Management Department at (910) 798-4400 to learn more. Despite a future permitted design capacity well in excess of 60 years, the New Hanover County landfill will eventually see the day when either landfills are no longer used for disposal, or the site reaches final capacity. In either case, the landfill must be “capped” and closed to state and federal requirements. “Capping” involves placing an impermeable liner over the waste to prevent further rain water intrusion into the waste. Why is this important? As rain water percolates through the waste, it picks up small amounts of contaminants, like arsenic, mercury, and volatile organic compounds (VOCs). This contaminated water is called “leachate” and must be treated to remove those contaminants. To reduce the amount of leachate generated after site closure, a membrane (typically 40 mils thick) is placed over the waste. To collect and divert clean rain water away from the waste, another layer is placed above the liner to collect and channel rain water to engineered detention ponds or percolation basins. Completing the cap is a 24 inch thick layer of soil, which is then vegetated to reduce erosion and provide habitat for wildlife. After final capping and site closure, the site goes into a 30-year “post-closure” period. During this time, the entire site is monitored by trained professionals. These workers are responsible for everything from mowing the grass and repairing fences to monitoring landfill gas generation, sampling groundwater and surface water quality, and managing any leachate generated. Once the site has completely settled and ceased generating leachate and landfill gas, it can be converted to an alternate use. The New Hanover County landfill team has developed a site plan for the post-closure use of the site as a nature park and Environmental Education Center. This park will feature several miles of landscaped walking and biking trails, and observation decks within the nearly 300 acres of pristine natural wetlands will highlight the abundance of flora and fauna to be found in this habitat. A planned kayak and canoe launch on Fishing Creek will connect users to the Northeast Cape Fear River, where the adventurous can paddle from the northwest portion of the county down to the Cape Fear River. For the less adventurous, several acres of constructed wetlands will offer a serene escape to anglers, bird-watchers, or for those just wanting to escape the stresses of daily life. The cornerstone of the site will be the Environmental Education Center, where visitors can learn about the importance of sustainable practices, such as reduction, reuse, and recycling. Visitors can also learn about the importance of water quality, ecological diversity, and their role in preserving our natural resources for the next generation. Reducing reliability on landfills and keeping our coastal environment clean and safe for our future generations is the mission of the recycling division. The Recycling Division is responsible for recommendations on solid waste reduction programs, public education on solid waste issues, and technical assistance to local businesses and citizens seeking methods to reduce their waste stream. The Recycling staff collects materials generated through the County’s drop-off recycling centers. Seasonal collections include the Christmas Tree Recycling program. In addition, the division staff maintains a database of organizations and businesses that provide the general public with information relating to recycling. As part of the County’s Integrated Solid Waste Management system, County Recycling collects recyclables from drop-off sites, and delivers it to the New Hanover County Material Recovery Facility (MRF) for processing and marketing. The Recycling staff services recycling drop-off sites throughout the County on a daily basis. These sites are for the convenience of NHC residents and small businesses that want to recycle materials that would otherwise be placed in their garbage containers. Recycling has numerous benefits including protecting our water quality, reducing air pollution, saving limited landfill space, conserving natural resources, creating jobs, and providing industry with raw materials for new products. The New Hanover County landfill has taken the first steps in developing a system to collect landfill gas and converting this renewable resource into energy. Landfill gas is a natural by-product of waste decomposition. This gas is composed of roughly 50% methane, 50% carbon dioxide, and a trace amount of non-methane organic compounds (NMOCs). Methane is is a potent greenhouse gas – over 20 times more potent than carbon dioxide. Twenty landfill gas collection wells have been installed and sampling of the gas has been completed. Analyzing the quantity and quality of the gas is an important step in determining how to design the gas collection and control system. The ultimate goal is to collect the landfill gas, compress it, purify it, and use the methane to generate electrical power. In late 2016, the department will begin connecting the wells together and routing the gas stream to a blower and skid flare, the first components of an active gas collection system. In 2017 and 2018, systems to remove hydrogen sulfide and siloxanes from the gas stream and the power generation equipment will be added. An estimated 2 MW of electricity can be generated through this type of system. We are very excited about the opportunity to dramatically reduce the site’s emissions while generating clean, renewable energy.